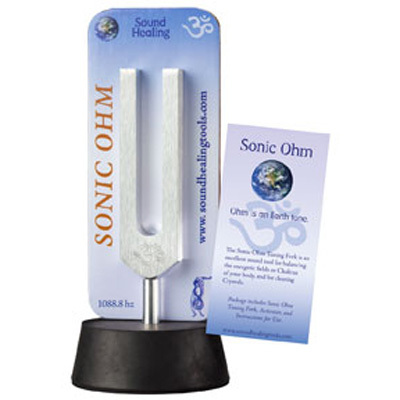 Package includes Sonic Ohm Tuning Fork, Activator, and Instructional Booklet. The Sonic Ohm is an excellent sound tool to help balance the energetic fields or Chakras of the body, and for space clearing and work with Crystals. The Sonic Ohm has a pleasing crystalline clarity, and is the highest frequency in the Ohm Therapeutics system. This higher expression of Ohm is also an earth tone, with its balancing and grounding properties. Explore more advanced sound layering techniques by combining the Sonic with the smaller tuning fork (544.4 hz) from the High Ohm Octave Set to create the Sonic Ohm Octave. Package includes Sonic Ohm Tuning Fork, Activator, and Instructional Booklet. The Sonic Ohm is an excellent sound tool to help balance the energetic fields or Chakras of the body, and for space clearing and work with Crystals. The Sonic Ohm has a pleasing crystalline clarity, and is the highest frequency in the Ohm Therapeutics system. This higher expression of Ohm is also an earth tone, with its balancing and grounding properties. Explore more advanced sound layering techniques by combining the Sonic with the smaller tuning fork (544.4 hz) from the High Ohm Octave Set to create the Sonic Ohm Octave. SPACE CLEARING: Energetically, a room, like a body, has a center and is responsive to the movement of Qi or the Feng-Shui of Sound™. The Sonic and High Ohm Tuning Forks are excellent tools for clearing and resetting the energy of a room. It is beneficial to clear and balance the space before and after a treatment. CHAKRA BALANCING: Ohm Tuning Forks are effective tools for directing vibration, and are commonly used by individuals who work in the body’s energy fields. Chakra balancing is one such practice. The high frequency of the Sonic Ohm is very effective for cutting through and clearing stuck or stagnant energy, helping to restore balance to the body’s chakras or energy centers. CRYSTAL CLEARING: Crystals are subject to many of the same environmental influences and stresses that people experience. A crystal will also benefit from a clearing and rebalancing of its physical body and the energetic field surrounding it. The high frequency of the Sonic Ohm Tuning Fork is an effective tool because it resonates well with the higher frequencies characteristic of crystals. Because crystals grow beneath the Earths' surface, where they remain until they are discovered, the Ohm vibration is a natural choice for resonating with and resetting the intrinsic Earth energy of a crystal.